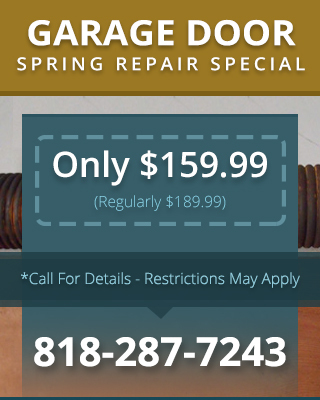 The goal of your garage door maintenance Thousand Oaks CA should be to correct current problems and prevent future ones. For example, we can identify parts that may need tightening, which will not only cure problems like noisy doors or underpowered springs, but also potentially help prevent other problems from developing. When all the parts on the door opener system are tight, there’s less chance of the door falling out of alignment and damaging the tracks or rollers in the process. Any major problems discovered during the maintenance visit will be brought to your attention immediately. We’ll help you weigh the pros and cons of repair versus replacement and choose a course of action you’re comfortable with. Are you sure that your garage door’s safety features are working properly? We urge you to be proactive in caring for your doors and invest in preventative maintenance. That way, you can rest assured that the safety features on your garage door are always in good working condition and will actually be able to protect you, your pets, or your kids from accidentally getting trapped beneath the door. No matter what kind of garage door opener system you may have, we can help adjust the photo eye sensors, reversing thresholds, and auto-open features as needed.